What do you do when you have three dominant trees to hunt in the same area? You have to pick one, of course. What happens when you pick wrong? Well... you might get some good video footage. About a month ago, I spotted a large-bodied buck with an impressive set of headgear leaving a hay field at dawn. It was a foggy morning and I was looking at him through binoculars from about 200 yards away. I couldn't make out the details of his rack, but from the general shape, it looked like he might be a pretty nice non-typical. Last Sunday, my buddy Ted and I did some scouting along a ridge in the area of his likely travel route to and from that field. We found three dominant trees, all white oaks, that were spread out in a straight line 75 yards long and running perpendicular to the length of the ridge. One tree was on top of the ridge, another was about midway down the side, and the third was close to a creek that ran down the hollow next to the ridge. All three trees had good fresh feeding sign and the lowest tree, next to the creek, had a couple feeding rubs nearby. To the east of the three trees is another ridge with very thick cover where I guessed deer would be bedded during the day. On Monday of this week, I hunted the area and set up between the two lower trees. Soon after I climbed the tree, the wind shifted from the North to the West, which sent my scent right over to the bedding area. Almost on cue, a deer started blowing, and blowing, and blowing some more. It blew at me for twenty minutes straight before finally moving on. About 30 minutes later six does came straight upwind toward me blowing occasionally. One of the does walked directly to the tree I was in, stopped about ten yards away, and looked up at me. They obviously knew I was there, but I guess the lure of fresh white oak acorns was more than they could stand. So when I returned yesterday with Ted (who was videoing), my plan was to pick out a tree to climb that would provide the best chance of keeping my scent out of the bedding area and the feeding areas. I seriously considered climbing a hickory tree that was about 15 yards downwind of the uppermost dominant tree. As we stood there checking the wind direction, it began to swirl so we decided to bag trying to set up for a downwind position and hunt the lower tree with the buck sign. BIG mistake! At about 5:30, I noticed movement near the uppermost dominant tree and signaled to Ted that there was a deer up there. Well, to make a long story short, we watched a beautiful buck feed on the upper dominant tree for 25 minutes. 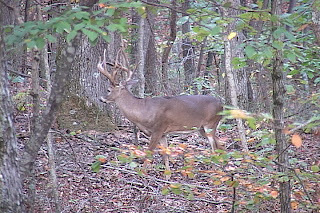 He was about 50 yards away, so I wasn't going to risk a shot. Unfortunately, he never came closer, so all we could do was watch as he fed contentedly about 15 yards from the tree I almost climbed. He was close enough that I couldn't move to reach for my binoculars so I really didn't know how big he was. Since Ted was watching him through the video camera he got a much better view. When it got dark and we started to climb down, I asked Ted, "am I going to cry when I look at the video?" All he could say was, "yup." Boy did he say a mouthful there! The best I can tell, he is a mainframe 10 with two kickers on his left G2 and one kicker on his right G2, giving him 13 scorable points. 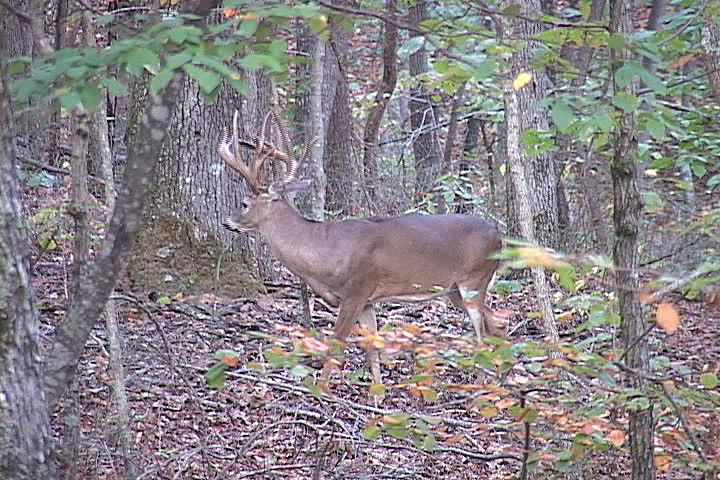 I named him the Crown Buck because of the way the kickers curve out, which gives his rack the appearance of a crown. Needless to say, I was disappointed for second-guessing my gut feeling, but that's just the way it goes sometimes. Oh well, the season is young. Hopefully, I'll get a second chance. I do believe around the 50 second mark is when I started to cry and then at the end. when he gives the 180 view while scratchin' his back. is when I completely lost it for ya. That is an awesome buck and I sure do hope that you get to connect with him.